Discussion in 'Applications' started by Stavf, Jun 11, 2018. Hey my name is Christian, I come from Denmark where I study Computer Science, and work part time as a software developer. I currently play Arcane mage, but will be looking to swap over to Shadow Priest in BFA. I am not leaving my guild as much as it fell apart due to lack of signups/ people wanting a break. So the reason I am looking for a new guild is to find a new place that I can call home and raid with. After not having played since Cata, I came back in the WoD prepatch, and created a druid. I then joined a guild(Lost Woods-Draenor) that was recruiting for Legion as a guardian druid. During EN progression a lot of the members wanted to transfer over to Silvermoon to go hard for progression, and so we ended up in (Free Will-Silvermoon). During the time here some members got frustrated with the progression and the amount of time, so we ended up not having enough members and the guild eventually fell apart. After this I didn't feel like finding another guild where I could tank. So I decided I just wanted to play more casually and I created my Mage, and never really did anything this tier. Around the time of ToS release some of the members from Free Will came back, and together with some new people we created the guild Synthesis-Silvermoon. Where due to not being able to find good tanks I had to go back and play my guardian druid. Then one day suddenly the GM and raidleader dissapeared from the game and never logged on again, which pretty much killed the guild. Now we come to AtBT, where I joined Necessity in the middle of the tier and stuck with them until Aggramar ~7 days ago, where the guild disbanded due to lack of signups and members wanting to take a break. 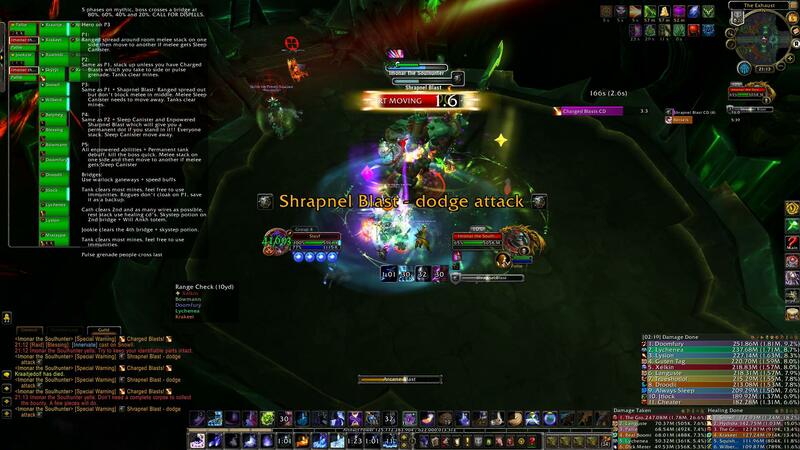 My mythic raiding experience started in Legion where I started after having been away from the game from Cata-WoD. At the start of Legion I played as a tank with a guardian as main and a prot warrior for split runs. Into TOS I wanted to swap over to ranged DPS, but due to having some hard times recruiting a new tank I stuck with tanking through the tier. After the tier I then started playing my mage as my main. With my current gear it's Haste>= Versa > Crit >> Mastery > Int. But depending on trinkets and legendaries haste and versa might change around. So normally as a mage I would say Altered-time.com and Discord. But because arcane has newer really been a hot pick the guides you find there are going to be outdated or just straight up wrong. And the same is sadly also the case for the discord server since all of the active members play either fire or frost. So I have had to use some other methods, the best resource for gaining the correct rotation was reading through the APL used in the sim for arcane, and replicating it as closely as possible, Then also analyzing the logs of the top arcane players on Warcraftlogs, to see if they had some changes to the rotation based on the fight. Mostly spending time infront of the training dummy to test out how my rotation changes with my current gear, since the amount of I have mana changes how my rotation goes. And then also going through my own logs and comparing them to others to see what I could improve. I don't currently feel comfortable with playing either fire or frost in a raiding environment. But during BFA I would probably be open to sometimes playing disc as an off spec if needed. Yeah I have nothing against criticism, having played a tank before I have been used to my mistakes being very apparent and for everyone to see. Yeah that should be no problem, my mic and PC is fine. I do have a vacation planned from 14/7 to 21/7. But other then that there is nothing.